The Cable Bay Adventure Park is Nelson’s adventure destination, set in magnificent native forest with views over the stunning Delaware Bay and located just 15 minutes drive from the centre of Nelson it is home to a wide range of adventure activities with something to cater for everyone. 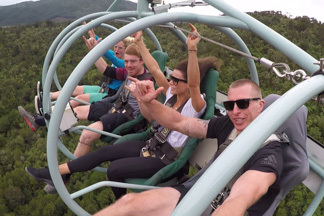 The ‘Skywire Experience’ is the Worlds longest Flying Fox which provides a shot of adrenaline mixed with an amazing scenic ride high above the forest canopy. 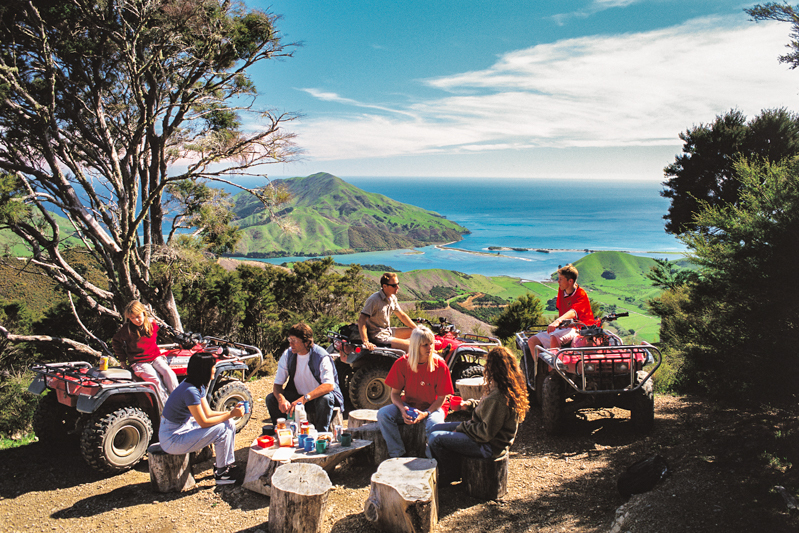 The guided ‘Quad Bike Tours‘ offer an unforgettable adventure where guests self drive the quad bikes through native forest settings, around areas of the farm and up to the magnificent costal views of the Cable Bay area. Enjoy the Adventure Park at a more relaxed pace with a guided ‘Horse Trek’ that takes in a variety of terrain including meandering rivers and forest trails that emerge at points with breathtaking scenic views. 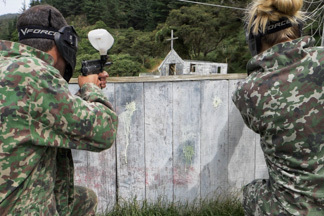 We operate the largest ‘Paintball’ theme park in Nelson, the paintball site offers a huge variety of paintball action featuring forts, trenches, creeks and much more. The ‘Argo’ is an amphibious all terrain, 8 wheeled vehicle – designed to go, well basically anywhere, catering to each specific group – from a leisurely tour to something a bit more thrilling. 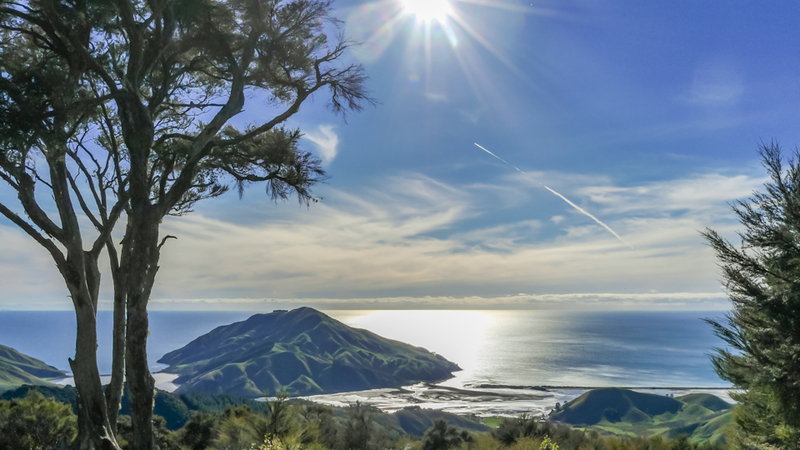 All our tours are great in the sun, and we get plenty of it in Nelson – but we also have a range of activities that suit when the weather isn’t at it’s best. The Quad bike tours, Argo and Horse treks are all great fun in the rain – we have wet weather gear to keep you (relatively) dry. Our cafe is open every day 9:00 am – 5: pm pm right next to Cable Bay road. Come and relax inside, on our deck or in the surrounding gardens. a great spot to stop in for a coffee or something to eat serving delicious Pomeroys Coffee and Teas and have a great selection of cabinet food and menu items. 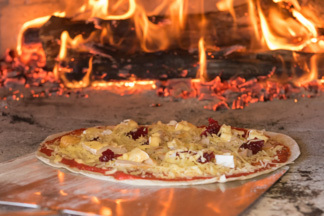 Wood Fired pizza’s are now being served Friday and Saturday afternoons from 1pm till closing or we can fire the pizza’s up on demand (allow 45 min for heating). We are licensed with a selection of local and imported beers, wines and ciders and a wide variety of low and non alcoholic beverages. We can also cater for large groups and functions by arrangement. The Worlds longest Flying Fox – set right here in Nelson. The one of a kind experience is a shot of adrenaline mixed with an amazing scenic ride high above the forest canopy. Set 300 metres above the base cafe your trip starts with a 4 km mini-bus journey up through the park to the launch platform of the Skywire. Your guides will entertain you on the trip up with facts and stories of the park and surround areas. The Skywire ride takes up to 4 people at a time, seated side by side, strapped into individual racing car style seats with 5 point harnesses and can reach speeds of up to 100km/hr. The ride takes you both forward and backwards, with 800 metres of gravity assisted freewheeling in each direction – combined with 700 metres of scenic journey in each direction, finishing back at the start after nearly 10 minutes of thrilling adventure. Many people rate the return backwards as the highlight of the trip. Universally appealing for every age (minimum height of 1.2m applies). The Skywire is weather depedendant – won’t operate in heavy rain or high winds. Bookings not always essential but highly reccommended in the busy summer season. See the online booking portal for current trip times and availability. A great learners ride – this tour takes you around the flat areas of the farm, through the river and is paced appropirately for those new to horse riding (or those on a tighter time frame). Duration: Bayview or South Side Trips 2.5 Hours approx. Explore the Cable Bay Adventure Park at a more relaxed pace with a guided horse trek. We have a range of treks to suit all abilities and our guides will ensure you are matched to a horse suitable for your size and ability. The treks take in a variety of terrain including meandering rivers and forest trails that emerge at points with breathtaking scenic views. Starting out along farm trails you climb up well graded trails to view points overlooking the either the main native forest block within the park with distant views to the stunning Delaware Bay. Light refreshments providied – suitable for confident beginners and up. Our latest product – combine your 2.5 hour horse trek with the famous Skywire ride. The ride takes you up to the Skywire on well graded forestry trails before you leave the horses and walk approximately 5 minutes up to the Skywire. 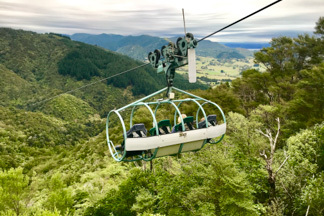 The Skywire ride and light refreshments follow before you return to the horses and continue out to the stunning Bayview lookout before returning to the base – suitable for confident beginners and up. 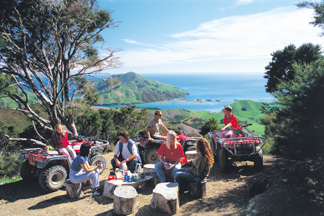 Combining excitement and adventure the quad bike tours are an unforgettable adventure where guests self drive the quad bikes through native forest settings, around areas of the farm and up to the magnificent costal views of the Cable bay area. Riders must be a minimum of 16 years of age to drive. We have a number of passenger quad bikes for those under 16 (minimum age 5 years) and can be driven by either a guide or by a friend or parent. Full instruction given and all drivers have a chance to hone their skills on the practise track prior to heading out on the tour. Please note that drivers must display a level of competence prior to being allowed on the tour – anyone not meeting a minimum level will only be able to take the tour as a passenger. This quad bike tour is designed to suit all abilities this tour follows the forest trails up to the Skywire before desending back to the farm and a trip around the flats. 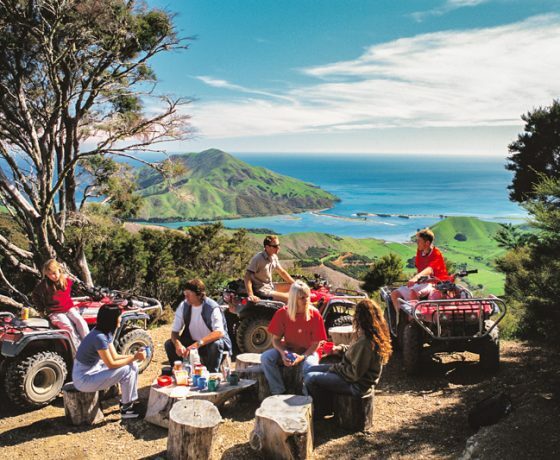 Combining excitement and adventure the quad bike tours are an unforgettable adventure where guests self drive the quad bikes through native forest settings, around areas of the farm and up to the magnificent costal views of the Cable bay area. This is our most popular ride – explore over 14km of beautiful forest trails. Ride past the Skywire then out to the stunning Bayview lookout which overlooks Delaware Bay before descending back through the farm. Light refreshments included. Riders must be a minimum of 16 years of age to drive. We have a number of passenger quad bikes for those under 16 (minimum age 5 years) and can be driven by either a guide or by a friend or parent. The Argo is an amphibious all terrain, 8 wheeled vehicle – designed to go, well basically anywhere. The Argo ride can be catered to each specific group – from a leisurely tour to something a bit more thrilling. Our expert operators can take the Argo through bogs, spins and turns, across rivers and through the farm – especially fun if it has been wet! Cable Bay Adventure Park operate the largest Painball theme park in Nelson. The Paintball site offers a huge variety of paintball action featuring forts, trenches, creeks and much more. Cable Bay Adventure Park takes every neccessary measure to ensure each individuals personal safety and we follow goverment guidelines in relation to health and safety for all visitors to our paintball site. All players receive a full safety briefing prior to the combat commencing – this covers proper use of equipment with an emphasis on safety precautions. All equipment that players are required to wear is issued prior to the games commencing and include padded jackets, overalls and full face non fogging masks for extra protection. The paintball field is open to the Public 7 days a week year round but advanced reservations are recommended. We require a minimum of 8 players to make a game however smaller groups and individuals may be able to join with other groups. Teams are divided so they are evenly matched while allowing players who want to play together to do so. Private games available by reservation.